Portland Vegan Obsessed With All Things Spicy. Every once in a great while you find yourself with leftover rice in the fridge but no craving for a stir-fry. What is one to do?! Why create a soup, of course! Most of my recipes are born out of random ingredients laying around in my fridge, like half a can of tomato paste, a handful of fresh herbs, a glass of wine (the sin!) or in this case, leftover cooked rice. I looked around and saw the leftover rice, some cooked chick peas, a small can of tomato sauce and the squeaky wheels started turning in my head. I happened to be in Puerto Rico at the time and had access to my favorite herb on the planet, culantro (known as recao in Puerto Rico and ngò gai in Vietnam). Though different than its Puerto Rican incarnation, culantro is more fragrant that cilantro, with a pungent aroma and taste. I was able to locate some at a Vietnamese market in Portland labeled as “ngò gai” and “Vietnamese parsley”. I assure you the search is worth it. You can substitute cilantro in this recipe if culantro is not available. After thirteen years of not eating meat, I have come to realize I am over tofu. Don’t get me wrong, I love it as much as the next person but I fell into a rut of cooking everything with tofu, ordering everything with tofu, and basically not expanding outside of my tofu bubble. This past summer I started having issues digesting soy so I cut it out from my diet. The result is better health and a new outlook on my food options. I’ve never made my own seitan, bought it to make at home or ordered it in dishes while out because good ole reliable tofu was always there instead. With tofu out of my life, seitan has snuck in and become my new best friend. My options for breakfast have definitely been limited by eliminating tofu from my diet. Enter seitan to save the day. This seitan potato hash hit the spot like the millions of tofu scrambles I’ve made in my day. The options are endless but this is the version I put together this morning. I love making extravagant meals as much as the next person but every once in awhile something simple, warm and delicious is all I crave. I created this recipe to be the least amount of work with the most amount of flavor using staples I always keep stocked. I use diced tomatoes with basil and oregano instead of adding my own herbs in order to keep it simple and consistent. You are welcome to used plain diced tomatoes and add your own fresh or dried herbs. This soup comes together really easily and feels warm and comforting after a long day. Serve with a green salad and some crusty bread. 1) Warm olive oil in a large soup pot. 2) Add onions, garlic, celery and salt. Saute until fragrant and translucent. 3) Add tomatoes, tomato paste and vegetable stock. Bring to a light boil. 4) Add potatoes then reduce heat to medium and cook for 20-25 minutes. 5) Add the green beans or peas and simmer until potatoes are tender. 6) Add the rest of the spices according to taste. Serve hot. I’m a big believer in making everything from scratch as often as possible. I also believe emergency food can save your day, which is why I always keep jar marinara in my cupboard but I always, ALWAYS prefer to make my own if the time is available. I’ve been making fresh marinara so much lately I have almost completely lost my taste for anything out of a jar. This recipe is simple, delicious and can be prepared quickly, leaving you time to toss a salad, boil pasta, or prepare anything else for your dinner. By the time all that is ready you will have piping hot homemade marinara awaiting you. This recipe can easily be halved but I prefer making a large pot of it to avoid having to dig into my emergency food stash later in the week. 1. Warm olive oil in a large dutch oven at medium high heat. Add onions and cook until translucent. Add garlic and stir for 2 minutes. 2. Add wine and let cook for 3-5 minutes. 3. Add crushed tomatoes and tomato paste. Bring to a light boil and then simmer. 4. Cook for a minimum of 30-45 minutes. Toward the end of cooking add salt, basil and red pepper flakes, if using. 5. Serve over pasta, polenta, pizza or use as a dipping sauce. I’ve always loved sorbet. What’s not to love about frozen fruit sweetened with a bit of sugar? It’s delicious, it’s refreshing and it’s relatively guiltless. I honestly didn’t think you could improve on this magical combination until So Delicious entered the scene. What could they possibly add, besides booze, to make sorbet better? Coconut water. Oh, coconut water how I love thee! What a brilliant concept! 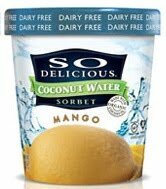 The coconut water sorbets quickly entered my life and I started finding ways to incorporate them into my daily life. I drink smoothies for breakfast 3-4 times a week so it seemed like the perfect place to start. The first time I sampled this recipe I was walking through the farmers’ market moaning my way through breakfast. Wait, did that sound dirty? Either way, here’s the super simple recipe! Place all ingredients in a blender and blend until smooth. Drink, moan. Once upon a time when I was in college I was stuck at my temp job with no food, no money and a killer hangover. I begged my boyfriend at the time to bring me some food and less than half an hour later he showed with this chick peas and peas pasta dish. I swear he saved my life that day plus this creation started my love affair with chick peas. I’ve been making this dish for over a decade now and it has gone through several changes since the original (olive oil, garlic, onions, chick peas, peas, s & p) was presented to me. It really is one of the easiest and tastiest things you can throw together when in a hurry especially since most of the ingredients are simple staples. This recipe lends itself well to a variety of flavors so feel free to experiment with other vegetables tossed in. 1. Warm olive oil and Earth Balance in a large saute pan over medium high heat and add onions with a dash of salt. Cook until clear and fragrant. Add garlic and stir to mix well. 2. Add chick peas, peas, and rice milk. Simmer over medium heat for 10 minutes. 3. Add shredded vegan cheese (if using) and the rest of the ingredients except the pasta. Cook for an additional ten minutes or until all the flavors are combined and sauce is creamy. Toss in pasta and serve with fresh ground black pepper. 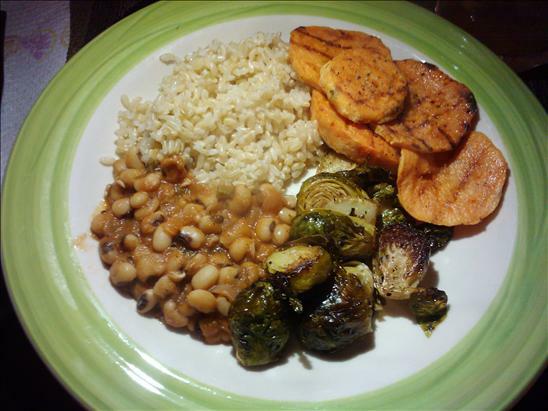 Oh how I love a plate of black eyed peas, brown rice, roasted brussel sprouts and bbq tofu. It is such a comforting combination of flavors and makes me oh so very happy. This is one of my favorite dishes to order at The Bye and Bye in Portland so I decided to create my own version. The picture below has grilled yams instead of tofu, which was a lovely complement to the meal. 1. Saute onions, garlic and celery over medium heat in oil. 2. Add jalapeño and continue stirring until vegetables are soft and fragrant. 3. Add a splash of water to deglaze then add the rest of the ingredients except thyme, salt and pepper. 4. Bring contents to a light boil, reduce heat and simmer partially covered for at least one hour, stirring occasionally. 5. Once most of the liquid is absorbed the beans are ready. Season with thyme, salt and pepper, serve over brown rice and enjoy! 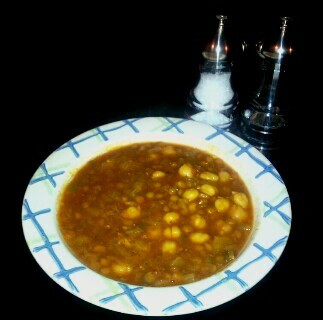 Chick Peas and lentils are easily two of my favorite legumes. I love their versatility in soups, pasta dishes, over rice, pureed for dips and in salads plus they lend themselves well to a variety of herbs and spices. Putting these two magical legumes together in a single dish may be the best idea I’ve had all year. The aromatic spices and tomato base of this soup are a perfect stage for these complementary beans to shine together. This rich dish could easily be served over rice though I found it to be ample and satisfying by itself. I’m convinced that there is no wrong way to make a soup. I rarely start out with a clear intention in mind but as I start chopping and picking ingredients out of the fridge my vision starts to come together. I often post my soup recipes so I have a rough guideline to follow the next time I’m craving the main ingredient i.e black beans, lentils, chick peas, etc… yet I rarely follow a recipe exactly as it’s more important to me to use up what is available and fresh in my fridge. This latest creation was warming and full flavored, a perfect rainy day soup. I experimented with pureeing it halfway down and then adding whole black beans and also pureeing the whole thing then adding more beans and both were delicious. The consistency will be entirely up to you as I think it works any way you choose. 1) Warm olive oil in a large soup pot over medium high heat. Add onions, carrots, celery, garlic and cumin and saute until onions are translucent. 2) Add hot peppers and chilies and stir together for 2 minutes. 3) Add 2 1/2 cups of black beans, tomato paste, cayenne, water or vegetable stock and bay leaf. 4) Bring to a light boil, reduce heat and simmer for 30-45 minutes. 5) Remove bay leaf. Add lime, salt, pepper and cilantro. 6) Puree according to preferred consistency. Add remaining cup of cooked beans and corn (if using) and simmer for another few minutes. 7) Serve with chopped green onions and tortilla chips.